A bit of background, for any who don't know. Ecuador straddles the equator, on the bulge in northwestern South America. The Andes run thru the country, north to south, splitting it into three major zones: the wide coastal strip, the highlands, and the Amazon basin in the east. Partly because of such varied topography, Ecuador is ranked as one of the two most biodiverse countries on the planet. One thing I was immediately reminded of, and that you will notice in many of my pictures: sunlight is noticeably stronger there, primarily because the sun's rays come in from directly overhead. In the highlands, add in the fact that as much as one-quarter of the Earth's atmosphere is below you, and you'll understand why the sunlight can be even more brilliant! The lower air density also means that light is diffused less, and so shadows there are deeper. Both those facts are evident in my first picture. 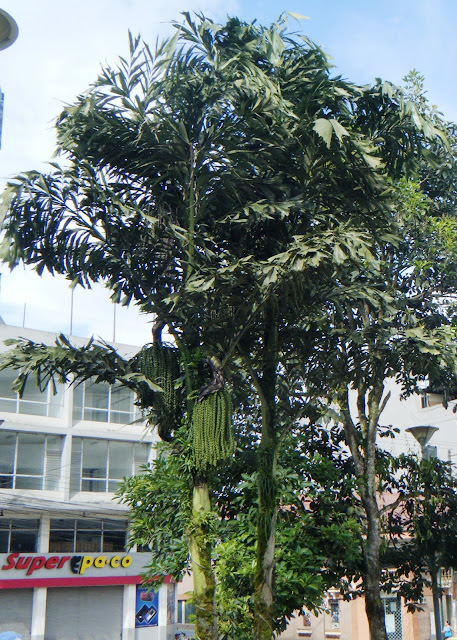 A street tree in Quito, Ecuador's capital; a decent natural slanter, don't you think? My wife Princene under that tree. The inflorescence suggests a possible relationship to Chionanthus. Eucalyptus are widely planted in the inter-Andean Valley and were a significant source of firewood. Few trees grow at this altitude without human intervention. The day after we arrived, we headed over the pass and down the slopes of the western cordillera to Santo Domingo de los Colorados, the city near which the Tsachila live. Typical scenery in the middle and lower altitudes: ridges covered with cloud forest. Pasture grasses in the foreground. The "Devil of Tandapi." Somebody had fun creating this! This waterfall was one scene I particularly wanted my wife and daughter to see. 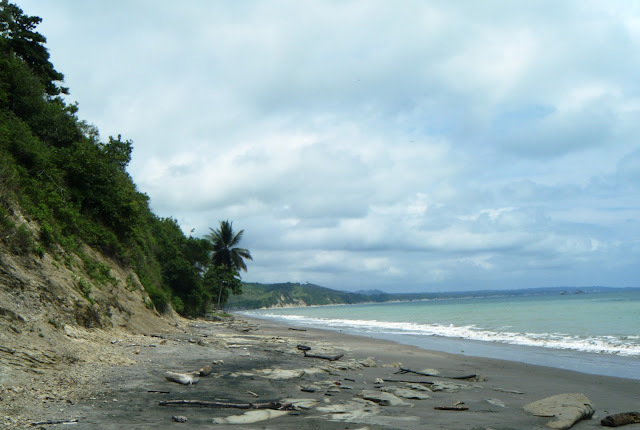 We were there at the beginning of the dry season, when overcast days are typical. A palm tree in fruit in the Santo Domingo plaza. After the interment service with the Tsachila, we headed for the coastal city of Same (SAH-meh) for some "unwind time." The view out over the Pacific from our accommodations. The tree with the buff inflorescence is teak (Tectona grandis), imported as a cash crop and widely naturalized. I have yet to identify the mimosa-looking tree. ... and my daughter demonstrates how to enjoy a fresh coconut! The base of this native Ficus almost made me drool! I'm still trying to identify the species. My brother and I found no remnants of a host tree, so I don't believe it's one the indigenous stranglers. without hesitation! Great food and enthusiastic service. of wood is very hard and strong, excellent for building as well as for spears, bows and arrows, and other implements. to meat! And the inner pith is often home to a particular beetle grub which is quite tasty when lightly cooked. 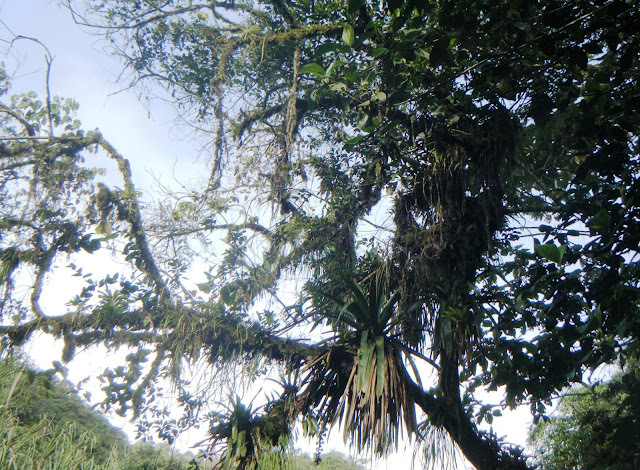 Epiphytes of various kinds cover a tree just outside Mindo. Trails like this one are very familiar to me. During our first years in Ecuador there were few roads in our area. A Cecropia tree growing as a natural bunjin. 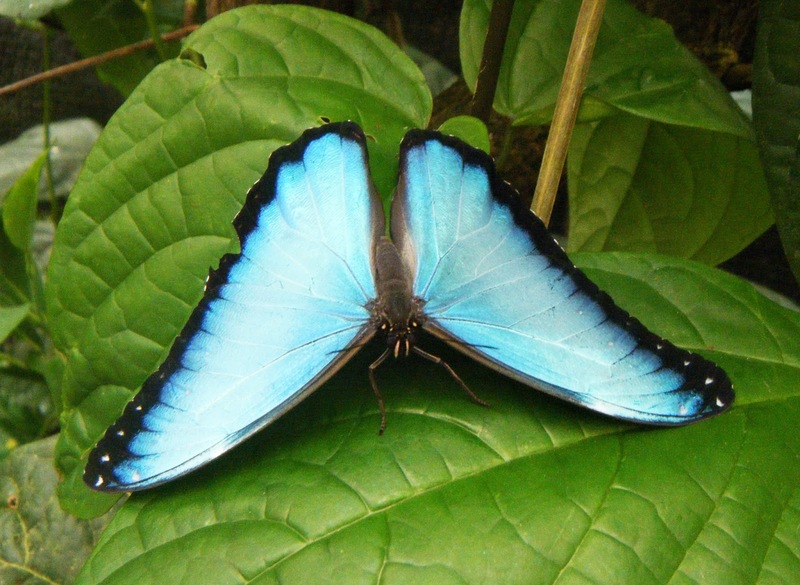 Mindo boasts a butterfly farm with excellent visitor facilities. This Morpho's wingspan is greater than my handspan. gives it its local name: ojo de búo, or "owl's eye." This one is feeding on a bit of mashed banana on my daughter's finger. Back to higher altitudes. The view into an extinct volcanic crater, in the eastern cordillera of the Andes. The exfoliating orange bark is very eye-catching, and the trees are often contorted by the winds. 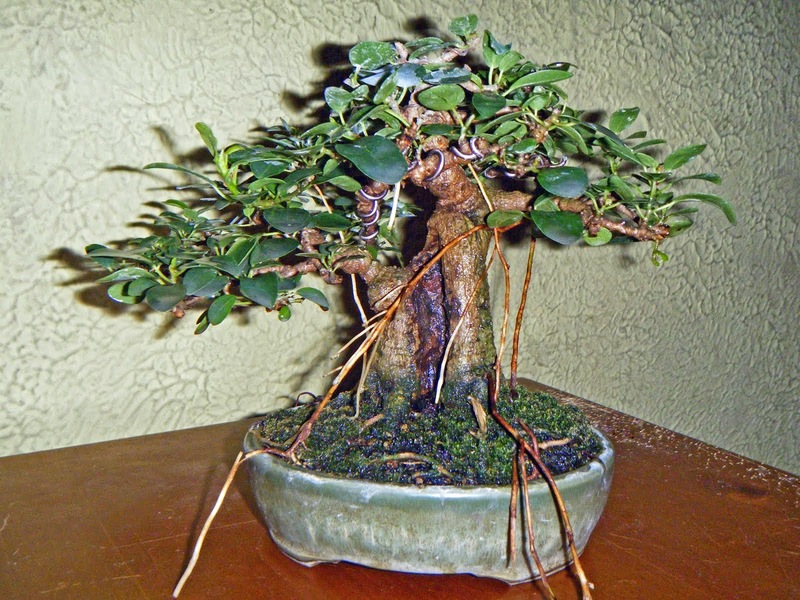 What I wouldn't give for a yamadori specimen! Individual leaflets are about the size of my thumbnail; perfect scale already! I'm in the northern, and our daughter is either in both or neither - take your pick! Princene broke her ankle in Same when she slipped on wet tile. Give her credit: she didn't let herself slow the group down any more than she could possibly help. While we wish it hadn't happened, we're thankful for the cost of medical care in Ecuador! More than half the cut roses sold in the USA are grown in Ecuador, in greenhouses like these near Baños. 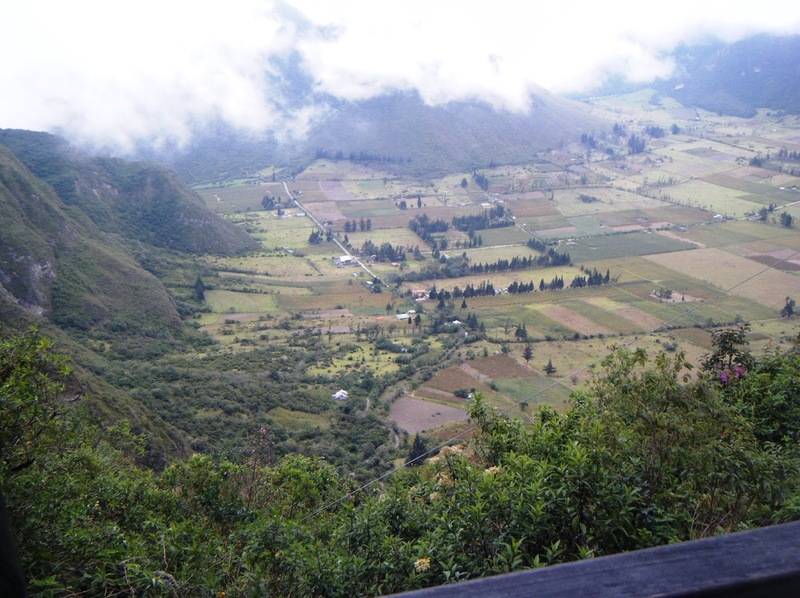 A fairly typical rural scene in the inter-Andean valley. I think this crater is named Pasochoa. Another street tree in downtown Quito. The sun was rising as our flight back to the US got ready to depart. At the interment service, one of the Tsachi men turned to me and my three siblings and admonished us, "Now don't you go back to your own country and forget us! You come back and visit us again." It was clear he was completely serious. 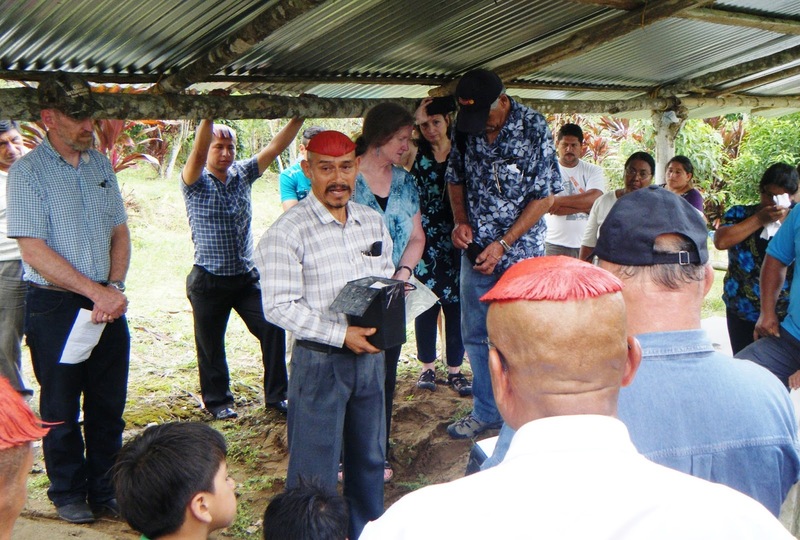 Dios mediante - with God's aid - my family and I plan to do just as he asked in a couple of years.